We decided to put our focus on this beautiful Asian Bride and keep her groom looking in the background. It is a tricky shot because you have to make sure both have an equal amount of light on them. We do this by using an off-camera professional flash. 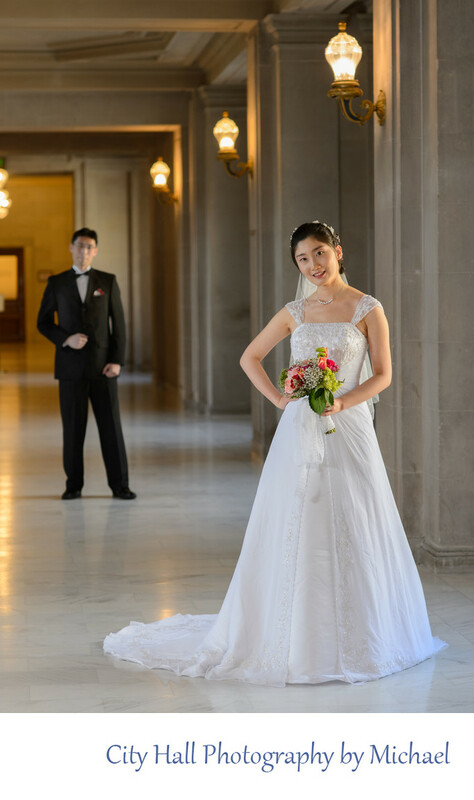 We bring this set up with us for all San Francisco City Hall wedding photography shoots. Blurring the groom slightly also has the effect of bring the bride more into sharp focus and attention. This selective focus wedding photography image is very popular with our newlyweds!